Cairns is a regional city in the far north of Queensland, Australia. The city was founded in 1876 and named after the then governor of Queensland. The region of Cairns ranks as the 4th most popular destination for international travelers in Australia. The city serves as a gateway point for those visiting the Great Barrier Reef. While being a gateway to Australia 's surrounding ocean, Cairns is also surrounded by rainforest, and also serves as a gateway to destinations like Daintree. Experience one of the seven wonders of the natural world when you climb aboard a high speed catamaran and set off for the Great Barrier Reef. As the world 's largest living organism, you 'll find over 2,800 individual coral reef systems which are home to amazingly diverse marine life. Their bright colors look remarkable against the turquoise waters. Jump in the water to snorkel and really experience the Reef in an immersive way! Stroll along the walking trails with a reef expert, simply relax on the beach, or meet with a marine biologist during an informative presentation. It 's a truly good day at the Reef, mate. Melbourne is the capital and most populous city in the state of Victoria, and the second most populated city in Australia. It is located on the large natural bay of Port Phillip. The city was founded on August 30th 1835. Melbourne is often referred to as Australia 's cultural capital because it is a major center for the performing and visual arts. Melbourne is said to be the birthplace of Australian dance styles, the Australian film industry, Australian impressionist art and the Australian television industry. Alice Springs is the third largest town in the Northern Territory of Australia. It is situated in the geographic center of Australia neat the southern border of the Northern Territory. The region around the area is referred to as the Red Center. This indigenous area is filled with endless desert landscapes and much aboriginal culture of the past. Ayers Rock is a large, sandstone rock formation in the southern part of the Northern Territory of central Australia. It lies 208 miles southwest of the nearest large town, Alice Springs. The rock is one of Australia 's most recognizable natural landmarks and stands at 1,142 feet tall and is 2,381 feet above sea level. Sydney is the state capital of New South Wales and the most populous city in Australia and Oceania. 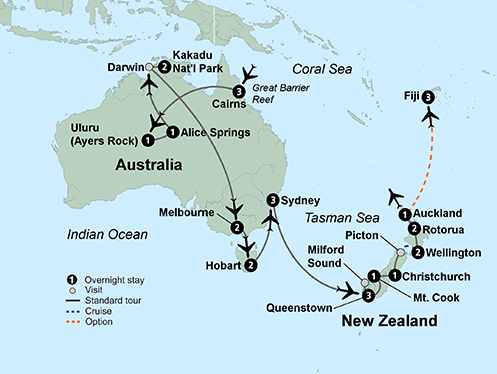 It is located on Australia 's east coast, with the metropolis surrounding one of the world 's largest natural harbors. The first British settlers founded Sydney is 1788, but the area around Sydney is said to have been inhabited for many years before. Millions of tourists come to Sydney each year to see its natural features such as Sydney Harbor and Bondi Beach, as well as Sydney 's man made attractions such as the Sydney Opera House and the Sydney Harbor Bridge. The Sydney Opera House is a multi-venue performing arts center in Sydney, New South Wales, Australia. It is situated on Bennelong Port in Sydney Harbour, adjacent to Sydney 's Central Business District and the Royal Botanical Gardens. The facility opened on October 20th, 1973. The opera house comprises several performance venues which together make one of the busiest performing arts centers in the world hosting 1,500 performances each year attended by some 1.2 million people. More than 7 million people visit the opera house each year. Choose to take a cruise around Sydney Harbour by high-speed boat to stop and explore a variety of great spots like beach resorts, historic Fort Denison or Taronga Zoo. If you 'd rather relax and enjoy a narrated cruise, you can do that too. Or ascend the Sydney Tower Eye for unparalleled 360 degree views of Sydney. After your incredible view from up high, visit the Sea Life Sydney Aquarium to see some of the world 's most incredible aquatic animals. Christchurch is the largest city in the South Island of New Zealand, and the county 's third most populous urban area and is located one third down the South Island 's eastern coast. Christchurch officially became a city on July 31st, 1856, making it the oldest established city in New Zealand. Christchurch is known as the Garden City due the large number of public parks and residential gardens. The Franz Josef Glacier Region is a region of New Zealand on the west coast of the South Island. This region is known as glacier country and is a UNESCO World Heritage Area. It features many natural attractions one can take part in, such as glaciers, beaches, wetlands, lakes, mountains and forests of national parks. Queenstown is a resort town in Otago in the southwest of New Zealand 's South Island. The city is built around an inlet called Queenstown Bay on Lake Wakatipu and has spectacular views of nearby mountains and the Southern Alps. The town was founded in the 1860s and is now known for commerce-based tourism, especially adventure and ski tourism, boasting over 200 adventure tourism activities to take part in. Hop into a cable car to ascend a beautiful mountainside in Queenstown, New Zealand for a dinner at the world-famous Skyline Restaurant. Feast on spectacular cuisine as you look out to enjoy sweeping views of the valley. Milford Sound is a fjord in the south west of New Zealand 's South Island. The sound runs inland for over 490 feet from the Tasman Sea and is surrounded by sheer rock faces that rise 3,900 feet on either side. Among the peaks are The Elephant at 4,977 feet, said to resemble an elephants head, and The Lion, at 4,272 feet, in the shape of the crouching lion. 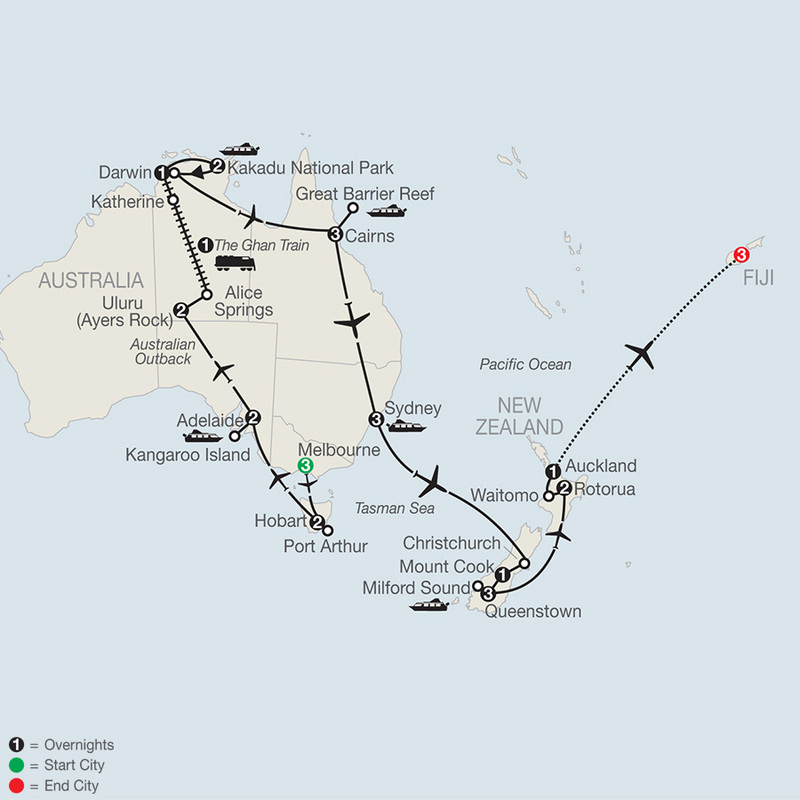 It is acclaimed as New Zealand 's most famous tourist destination. Mt. Cook National Park is located in the South Island of New Zealand. New Zealand 's highest mountain, Mt. Cook, lies within the park. The area was established as a national park in October 1953 and covers about 270 square miles. with glaciers covering over 40% of the park. It is a popular place for skiing, hunting and mountaineering. Enjoy a home hosted meal with a family during your stay in New Zealand. Meet and talk firsthand with a friendly Kiwi family who is delighted to share their culture, traditions and home with you. Explore the diverse wonders of the lands Down Under. An adventure that includes a “Dreamtime tour” in the rugged Outback introduces you to the Aboriginal life and culture of Alice Springs and Ayers Rock. Meet the Drum Atweme, a musical group supported by the Collette Foundation comprised of at-risk youth. Delve into the colorful world of the Great Barrier Reef. Enjoy a guided tour of the Sydney Opera House and a dinner cruise on Sydney Harbour. Enjoy a choice of a harbor cruise pass or visits to Sydney Tower Eye and Aquarium. Meet Australia's famous wildlife up close. Explore the snow-capped peaks, vistas, gorges and waterfalls of New Zealand's Southern Alps. Cruise Milford Sound. Settle in for a 3-night stay in Queenstown, one of New Zealand 's prettiest towns. Enjoy sweeping views from the famous Sky Line restaurant. Experience the Franz Josef Glacier and the majestic Mt. Cook region. Discover the beautiful 19th-century gold rush settlement of Arrowtown. Cap off your adventure making new friends when dining with a family in their home. Your tour opens in Cairns, the tropical gateway to one of the world 's most spectacular natural attractions - the Great Barrier Reef (UNESCO World Heritage site). Established as a marine park in 1975, the reef is a haven for thousands of species of sea life, as well as turtles and birds. Board a catamaran and sail to the Low Isles to explore the fascinating underwater world of the Great Barrier Reef. Choose how you want to spend your day in paradise by making your time on the reef as educational or as laid back as you like. Perhaps you will relax and independently explore the pristine shores of this tiny sand island located on the outer reef. Or maybe you are a bit more adventurous and will go snorkeling, revealing a wealth of vibrant sea life. You also have the opportunity to meet with a marine biologist during an informative presentation. Or you may opt to join an expert for a beach and heritage trail walk along the island. The morning is yours to explore the town at your own pace or simply relax and soak up the tropical atmosphere. Perhaps you will take an optional tour on the Skyrail Rainforest Cableway for an unforgettable experience that takes you above the rainforest canopy for a bird 's-eye view of unspoiled natural beauty. This afternoon, visit Hartley 's Croc Farm for a chance to get up-close with crocodiles in their natural habitat. Boardwalks take you on a path of adventure through rainforests and woodlands to see animals such as wild birds, reptiles and wallabies. You may meet some of the local koalas and chat with a wildlife naturalist to learn more about these cuddly creatures. Fly to the beautiful Victorian city of Melbourne. Set around the shores of Port Phillip Bay and the Yarra River, the city exudes a lively and cosmopolitan atmosphere. Set out on a city tour and see Fitzroy Gardens, valued for their historic and horticultural significance, and the bustling “laneways” of Melbourne. Later you may participate in an optional tour to Phillip Island, a renowned nature reserve and home of the world 's largest colony of Little Penguins; protected and studied by rangers, hundreds of them waddle out of the sea and cross the beach to their burrows in the dunes; at the interpretation center, you have a chance to learn about the lives of the Little Penguins and their significance to the area. It 's on to the vast landscapes and tranquility of the Outback. Your flight takes you to Alice Springs, the perfect place to begin exploring this unique land. A special experience is in store this evening as you have the opportunity to meet the young Aboriginal group, Drum Atweme. Supported by the Collette Foundation,* Drum Atweme is a musical group comprised of at-risk youth from the local community. Tonight, continue your cultural immersion with a memorable bush dinner set against the backdrop of this unique desert environment. Access the history and culture of the Walpiri Aboriginal people during a "Dreamtime Tour.” A specialist guide shares Aboriginal creation stories and explains everyday life. This afternoon, discover a more modern side to Outback life when you visit the Royal Flying Doctor Service, a lifeline to thousands across the vast terrain of Central Australia. Later, tour the Old Telegraph Station and Anzac Hill with its excellent views of Alice Springs and the surrounding area. Deepen your exploration of Sydney 's many wonders with a day at leisure. Tonight, say your farewell to Australia by chatting with new friends and taking in the sights during a delightful dinner cruise of Sydney Harbour. Marvel at the scenic vistas the harbour has to offer including Sydney 's magnificent skyline and iconic attractions: the Sydney Opera House and the Harbour Bridge. 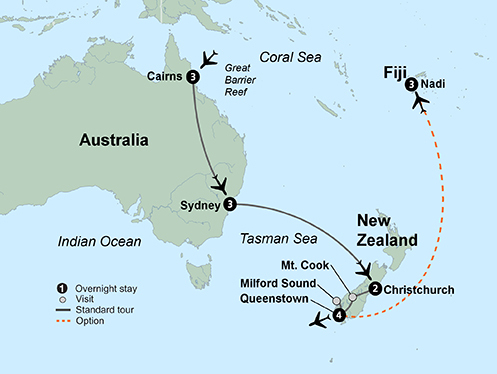 Leave Australia behind and fly to the historic city of Christchurch, New Zealand. Devastated by an earthquake in early 2011, see firsthand how the “Garden City” is recreating itself during a sightseeing tour that highlights the city 's magnificent gardens and elegant park district. Take in marvelous snowcapped peaks, rugged mountains, and beautiful river gorges as you cross the Southern Alps. You may choose to take the TranzAlpine train (optional) for a truly inspiring train ride through this glorious scenery. Arrive in the Franz Josef Glacier Region, which offers travelers a rare opportunity to experience a living glacial landscape in a temperate environment. Before departing Franz Josef, if the dynamic New Zealand weather cooperates, you may opt to see this beautiful glacier region from a bird 's-eye view during a flightseeing tour. En route to Queenstown, watch as the amazing landscape unfolds before your eyes as you pass through the rainforest, bordered by the Southern Alps and the twisting coastline. Cross jade green glacial rivers, view thundering waterfalls and enjoy dramatic changes in scenery. After crossing the Haast Pass, arrive in Queenstown, one of New Zealand 's prettiest towns. Tonight, ascend the mountainside on a cable car for dinner at the Skyline Restaurant. Enjoy sweeping views of the valley. Journey to Milford Sound. Soak in the rugged grandeur of the Hollyford Valley. You 'll travel through ancient beech forest via the Homer Tunnel. During a cruise of the breathtakingly beautiful Milford Sound, you 'll see why this fjord is one of the most visited sights on the South Island. With rock faces that rise nearly 4,000 feet on either side, the scenery will take your breath away. Following the cruise, you return to Queenstown. You may choose to return via a short optional flight (weather permitting) for spectacular views of New Zealand 's Southern Alps. Enhance your free day with a variety of optional activities. Shop in the charming village center or enjoy an optional and exhilarating jet boat ride on the Shotover River. Perhaps you will join the optional "Journey through Middle Earth" tour which takes you through the majestic Remarkable Mountains and the breathtaking Queenstown countryside showcasing many of the spots where The Lord of the Rings movies were filmed. Or…just relax! Set off for the beautiful 19th-century gold rush settlement of Arrowtown, a boomtown during the 1860s gold fever. Next, enjoy a tasting and tour at one of New Zealand 's famous wineries. Then, sample the freshness of the Central Otago region with a stop at a local fruit stand. Follow the Kawarau River and cross Lindis Pass before arriving in New Zealand 's most famous national park, Mt. Cook. Savor some free time in this Alpine paradise. You may choose to take a nature walk, enjoy an optional glacier flightseeing tour (weather permitting) or simply meditate on the beauty of the Southern Alps. Your tour comes to a close, leaving you with many pleasant memories of a wonderful vacation. Traverse the “Red Centre” as you drive to Uluru (the Aboriginal name for Ayers Rock) in the heart of the Australian Outback. This huge monolith and the sandstone domes known as Kata Tjuta were created through the process of upheaval and erosion. Tour the base of "the Rock," learning about its geology and significance to Aboriginal culture. Prepare for a truly majestic sunset as you witness the changing colors of Uluru accompanied by a champagne toast. This morning, tour Kata Tjuta before saying farewell to the quiet of the rugged Outback. Fly to Sydney, an energetic metropolis. Upon arrival in Sydney, enjoy dinner in the bustling Darling Harbour restaurant area. Begin the day on a panoramic tour of the landmarks of Sydney. See Kings Cross, the Harbour Bridge, Circular Quay, the Botanic Gardens, fashionable Paddington, and the Rocks, Sydney 's oldest district. Next, discover one of the world 's most fascinating architectural sights on a guided tour of the Sydney Opera House, poised majestically on Sydney Harbour. Then you 're in for a unique experience as you learn firsthand about opals during a special presentation at the National Opal Collection. This afternoon the choice is yours! Experience the area at your own pace with a Sydney cruise pass. Travel by high-speed boat to a variety of spots on Sydney Harbour. Visit the famous beach resorts of Manly and Watson 's Bay, historic Fort Denison or Taronga Zoo. Hop off to explore places of interest or stay on and relax during a narrated cruise. Or choose to ascend the Sydney Tower Eye for incredible views and then explore the renowned Sea Life Sydney Aquarium. On your return to Christchurch this afternoon, visit Willowbank Wildlife Reserve for a guided tour focused on New Zealand 's wildlife and natural heritage. As you walk through the forest reserve, learn about conservation efforts dedicated to saving native species while viewing them in their natural habitat. A special treat is in store for you tonight as you dine with a New Zealand family in their home. 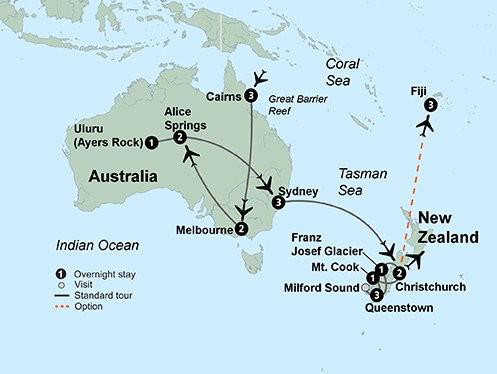 Meet and talk with a friendly Kiwi family who is delighted to share their culture, traditions and home with you. •	Centrally-located hotels provide a home away from home. 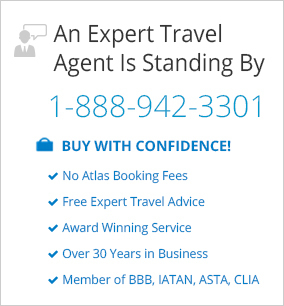 •	A professional tour manager accompanies you throughout your trip. •	Expert local guides provide insightful, personalized tours. •	Enriching cultural experiences bring the destination to life. •	Private climate-controlled motor-coach enhances your tour. •	Free round trip sedan service that takes you from your home to the airport when you purchase an air-inclusive Collette tour (within 50 miles of nearest airport gateway). •	17 meals. Welcome and farewell dinners feature local specialties.